Bottle-Matic bottle labelers enable the user to label all kinds of cylindrical objects by simply inserting the container and pressing a foot switch. Once the foot switch is activated the label is applied at over 4.5″ per second, most water bottles are labeled in less than 2 seconds! This allows the user to quickly remove the bottle and insert another to start the procedure again. Once a rhythm is established bottles are labeled VERY quickly. label objects from .5″ to 6″ diameter. From a Test Tube to a 1 gallon bottle . Dispensa-Matic Label Dispensers pride in ORIGINATION! 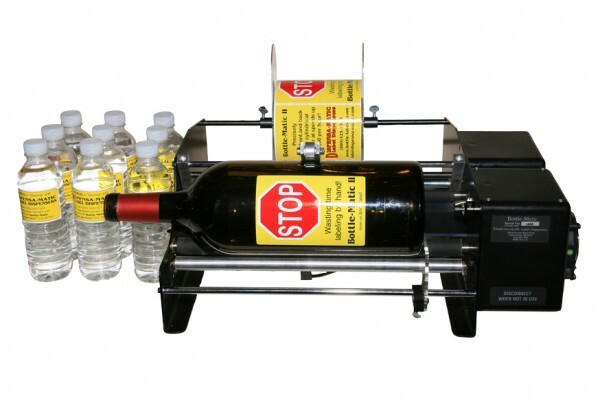 While others copy our technology and designs, we continue to be in the forefront bottle label applicator design. Micro-Switch activated, will work on all kinds of labels. We manufacture the Bottle-Matic, so we are able to do any modifications necessary for those hard to label containers, but labels most containers without modification.